A big thanks to the folks who take pictures for me, to those who send me pics, and to Arleigh, who does my image editing! 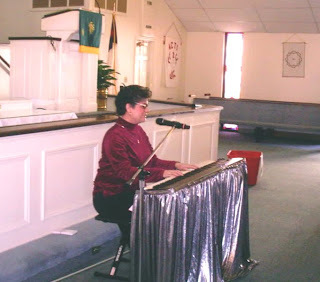 Here I am at my piano in the sanctuary of Goose Creek United Methodist Church in Goose Creek, SC. I can’t believe it’s been a month since I brought The Message In Music during that Fifth Sunday Service in January! I have so many fond memories of time spent with this congregation: greeting folks and singing to them as I walked from the back of the church to my piano; sharing my music and testimony; reading God’s Word from my Braille Bible; inviting the children to come forward for an impromptu jam session; listening to God’s kids of all ages as they sang along with me throughout the service and, oh yes, that delicious potluck lunch! During this special day, God blessed me with an opportunity to meet another of His “outa sight” kids”, eight-year-old Christian, who came to church with his mom and dad. Christian is already learning to play the guitar, and is looking forward to trying out “The Coaster” my Blind Youth Chaplaincy’s tandem bike! With February came the Second Annual South Carolina Regional Braille Challenge. Once again, my love for Braille literacy and God’s calling to help blind youth led me to volunteer to serve on this event’s judging panel. I was delighted to see that the number of students participating had tripled since last year! Mentoring and tutoring continued through February, in spite of some unusual weather for this area. Taylor is doing great with his Pac Mate computer, reading and taking notes on a library book and learning to apply the scientific calculator to his algebra. Brianna and Shelby, both of whom placed in their age categories of the Braille Challenge, have also expressed an interest in joining me in this year’s Cooper River Bridge Walk. This has launched a personal initiative of mine to encourage exercise among the kids. I found a nifty little talking pedometer at The Braille Super Store that will get us all thinking more about how many steps we take during the day, or during a workout. What would we do without our gadgets! All of this, and so much more, is made possible by folks like the people of Goose Creek Church, and folks like you! Thank God, and thank you, for your support! Stay tuned for more highlights. Until next time, God bless you, and keep His Song in your heart!